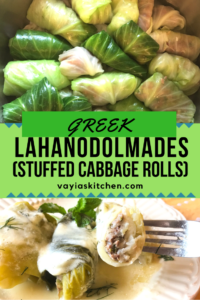 Lahanodolmades Avgolemono – AKA Greek Stuffed Cabbage Rolls – is a classic Mediterranean dish. These little babies are a super delicious one pot meal. 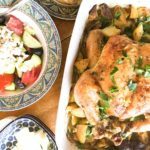 They taste even better the next day, and are great for lunch, dinner, and anytime in between! 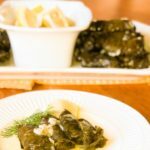 Lahanodolmades Avgolemono may take a little time to prepare, but oh boy are they worth it! 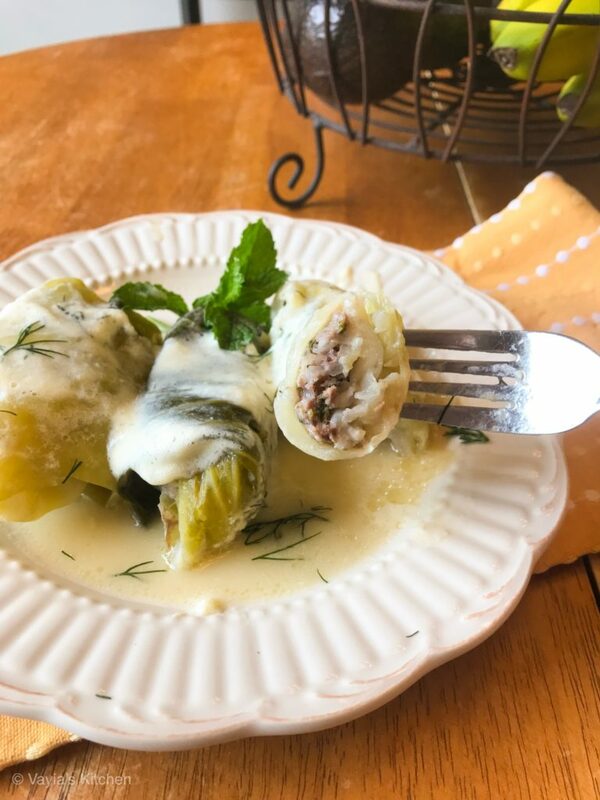 These delicious little bites of goodness are made with ground beef, rice, spearmint, and dill, then wrapped in softened cabbage leaves and steamed until they’re nice and tender. 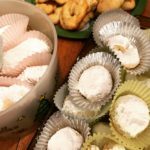 They’re then covered in a blanket of avgolemono (egg lemon) sauce that adds a tangy and flavorful compliment to the savory filling. If you’re an Avgolemono fan, than you have to try my Youvarlakia Avgolemono Soup recipe. 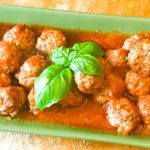 Meatballs and egg lemon sauce? You’ll think you died and went to heaven! 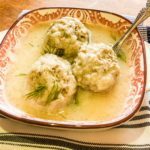 Lahanodolmades Avgolemono are also very easy to customize if you prefer not to use ground beef or any meat at all. 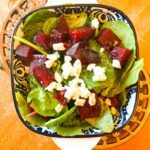 Simply substitute with one pound of any type of ground meat – chicken, turkey, venison, pork. If you prefer to make your dish meatless, increase the amount of rice from 1/2 cup to 2 cups! Fill a dutch oven 2/3 full of water. Cover and bring to a boil. In the meantime, rinse a head of cabbage and with a sharp knife, remove the core. This will help you to peel the individual leaves of cabbage. Carefully peel off each cabbage leaf, being gentle enough to not tear the leaf. Place the leaves on a sheet pan and set aside. Place another dutch oven next to your work surface. Take a scraps or broken pieces of cabbage and line the bottom of the pan. 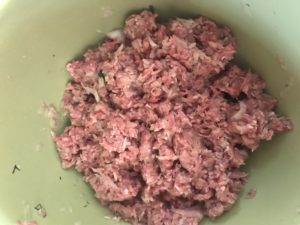 In a large bowl, combine ground beef, rice, herbs, olive oil, and salt and pepper. 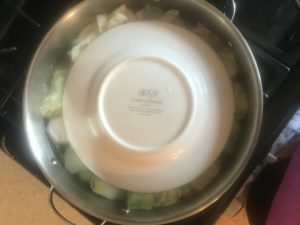 When the water comes to a boil, place two cabbage leaves in the water (or as many will comfortably fit) for about 2 minutes, until the leaf is wilted. Remove with tongs and place on your work surface. Allow to cool slightly before handling. 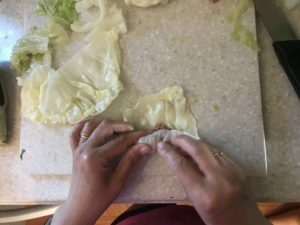 Take a heaping tablespoon of filling and place in the center of the cabbage leaf. Fold the leaf over tightly, fold in the sides and roll into a cigar-like shape. Place seam-side down in the dutch oven. Continue placing your cabbage leaves in the water and wrapping your cabbage leaves until you’ve used up all of your ingredients. 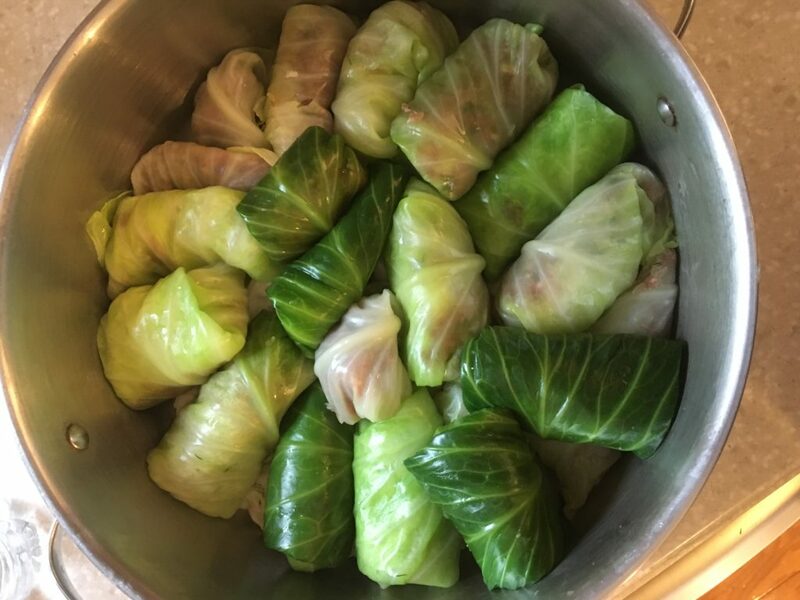 You will end up with two layers of closely-packed cabbage rolls in your pot. Place the dutch oven on the stove and fill with chicken broth (roughly 24 oz.) until the cabbage rolls are slightly covered. Take a flat dinner or salad plate (whichever fits) and place upside down on the rolls to hold them in place. Cover and bring to a boil and then lower heat to a simmer for about 40-50 minutes. You’ll know they’re done when you can easily pierce with a fork. 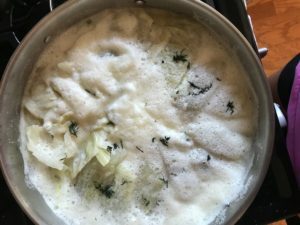 While the cabbage rolls are simmering, prepare the avgolemono sauce. 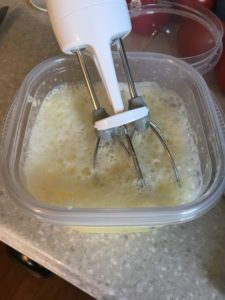 In a large plastic Tupperware container or bowl, whisk the egg whites until they are frothy. Add the lemon juice and whisk again. Add each egg yolk and whisk until incorporated. When the cabbage rolls are finished cooking, take 2-3 ladles full of broth and add to the egg lemon mixture, whisking after each ladle full. Slowly pour the egg lemon mixture over the cabbage rolls. Allow to simmer for 5-10 minutes to bring to temperature. 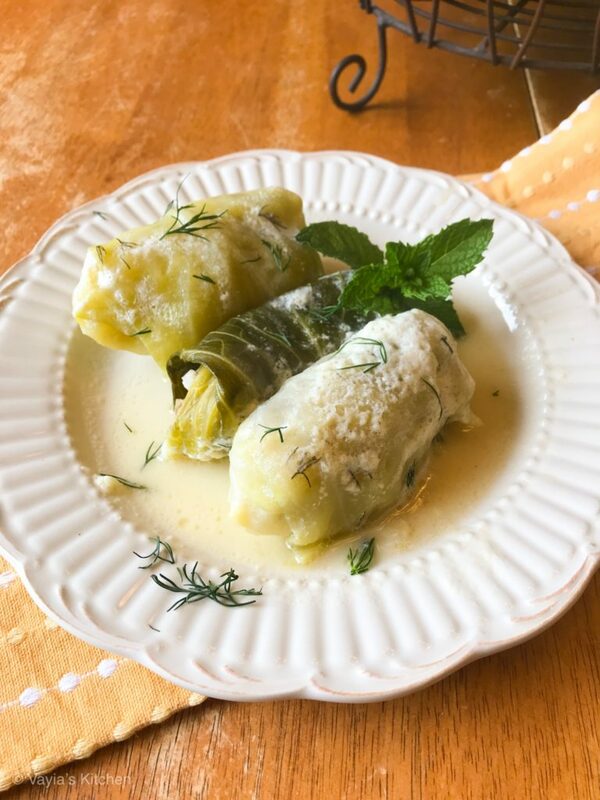 Lahanodolmades Avgolemono (Greek Stuffed Cabbage Rolls) are a delicious, traditional Greek dish made with ground beef and rice, and flavored with onion, fresh dill and spearmint. Perfect for any day of the week! Continue placing your cabbage leaves in the water and wrapping your cabbage leaves until you've used up all of your ingredients. 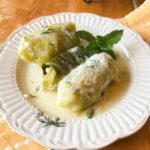 You will end up with two layers of closely-packed cabbage rolls in your pot. Cover and bring to a boil and then lower heat to a simmer for about 40-50 minutes. You'll know they're done when you can easily pierce with a fork. Yum! As you may remember I do make Halupki – very similar but without the sauce you use. I will definitely try this version! Is the rice cooked or uncooked? I just found your site, everything looks DELICIOUS. 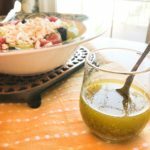 My husband loves Greek food, I can’t wait to try these out. Hi, Amy. 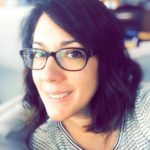 I’m so glad you found the site! 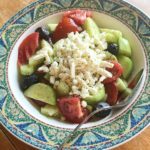 You’ll add uncooked rice to the filling. It’ll cook perfectly during the long simmering process. 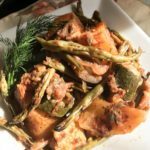 Let me know how you like the recipe.